An intriguing optical illusion has been leaving social media users scratching their heads this week. 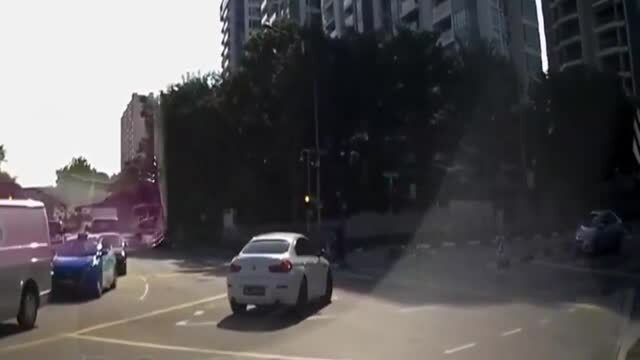 Footage recorded by a vehicle’s dash cam in Singapore recently shows the moment a silver car appears, as if from nowhere, right in front of another car that is exiting a busy intersection. The video ended up going viral, with various media outlets referring to the vehicle as a ‘ghost car’. According to reports, nobody was injured in the smash, however there has been a lot of confusion over exactly where the offending vehicle came from at the moment of the collision. The answer, as it turns out, is that it was actually there all along, moving towards the right just as the white car was doing the same. From the perspective of the camera, the silver car is hidden from view and only becomes visible when the white car stops at the intersection. The shadows on the road and the distortion of the dash cam also help to cement the illusion.